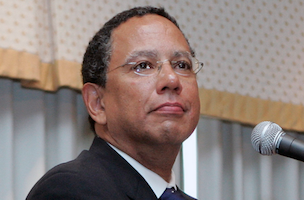 It has been an interesting couple of months for Dean Baquet, to say the least. The executive editor of The New York Times had a malignant tumor removed from his kidney on Saturday, only two days after doctors discovered it and felt it required immediate attention. In a memo to Times staffers, Baquet sounded upbeat about the situation. He described the surgery as “minimally invasive” and “completely successful.” “My doctors have given me an excellent prognosis,” added Baquet. Baquet was named the executive editor of the Times just last month. As you’ve probably heard by now (several times, we imagine), Baquet’s ascension came under murky circumstances in which Jill Abramson was fired. Hopefully the next couple of months are a lot calmer for Baquet than the last two.